The issue opens with Splinter teaching the Turtles about Japanese mythology, where a male god named Izanagi is accompanied by a female god named Izanami, who watches as the male removes his eyes and creates the sun and the moon with them. Together, the two formed the Japanese islands. The TMNT, Master Splinter and April have stowed away on a plane headed for the Land of the Rising Son. Leonardo asks April to reiterate her tale, and the reporter reluctantly agrees. O’Neil explains that she had been in Chinatown when she ran into Fu Sheng and Chu Hsi (the human alter ego of The Warrior Dragon from issue #20), and soon after ninjas had shown up and kidnapped Fu Sheng. Chu changed into the form of the Dragon and fought the ninjas, but they used a powder to knock him out and revert him to his human form – and then they took off with both Chu and Fu. April and Splinter then began investigating Chinatown looking for clues, and eventually found some thugs involved in the kidnapping. When they began questioning one of the villains, strange ninjas dressed in white attacked them. April was shocked to discover that when the white ninjas were dealt a severe blow, they dissipated into a sorcerous vapor. After defeating the strange ninjas, the thug told April and the Sensei that Chu Hsi and Fu Sheng had been taken to Hiroshima, Japan. Just as her tale concludes, the plane begins its descent to the Japanese city. Meanwhile, we see a youthful Japanese girl kidnapped by some ninjas garbed in black, who take her to a secret warehouse headquarters near the ocean. There, she meets a new villain, wearing a Samurai mask and calling himself Chien Khan. Khan states that the girl’s soul will serve them well, when Fu Sheng interrupts and states that it is his soul that they seek. We then see that Chu is lying unconscious on a table, and Chien Khan states that he desires neither the old man’s nor the young girl’s soul – but that of the Warrior Dragon that resides in Chu Hsi – and he intends to get it, with the assistance of Fu! Meanwhile, the TMNT and April scam their way out of a jam at the airport by convincing the securtity guards that they’re American actors in costume. One of the guards recognizes April as a famous reporter and escorts our heroes to their “limousine.” As soon as possible, everyone ducks into a sewer. Splinter announces that they’ll need to look for clues topside once night falls, and the group heads to the east under the Sensei’s orders. The TMNT are surprised to find that the sewers are newer than those of NYC, since they thought the Japanese city was older than their home, and Splinter explains that everything had to be rebuilt after the city was almost completely destroyed during World War II. Back at the docks, Chien Khan revels in his opportunity to appropriate the soul of the Warrior Dragon. The villain demands that Fu assist him and the old man refuses – until Khan threatens to kill the girl. Unfortunately for the Turtles, as they try to negotiate safe passage through the sewer, a group of black-grabed ninjas attack the youths. Having started the fight, the ninja retreat to leave the battle to be fought between the TMNT and the young men, who think that the Turtles are “oni” (demons). The TMNT win the fight and move on, as there’s no sight of the ninjas who had begun the struggle. Splinter states that they will go to the Peace Memorial at the heart of Hiroshima – the Sensei’s comments are overheard by one of the ninjas, and he retreats to Chien Khan’s headquarters and tells him the news. 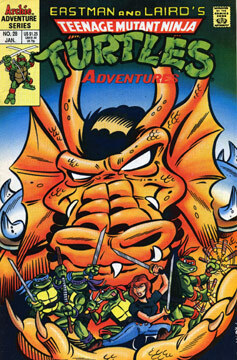 Khan tells Fu Sheng that his friends have arrived to try to help him – so the masked villain sends his most trusted warrior to defeat the Turtles – the fox named Ninjara.